The Emergency First Response gives you the confidence to respond to medical emergencies — not just in the diving world, but in your every day world with your family, friends, neighbors and coworkers too. 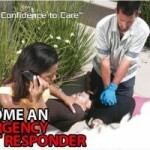 The Emergency First Response course will take you one day to complete it. The Emergency First Response training is about learning serious medical emergency response skills in an upbeat, positive environment to gain the confidence to help in an emergency situation. Build upon what you’ve already learned, to teach how to prevent problems, and how to manage them if they occur. Build on your skill and focus on developing your instructional abilities to teach these skills to others. Instruction by a PADI Emergency First Responder Instructor. PADI Emergency First Response certification fee. Padi Emergency First Response manual.